Thea Clayhill: [Thea cleans Greg's glasses and puts them back on him] I hope you don't mind. I just couldn't take it anymore. Nick: Oh wow. Wow, I can see. Oh my god, Thea. I don't know if you know this but y- you're pregnant. Thea Clayhill: Your sense of humor really takes a dive after 9 o'clock, huh? Nick: Is it after nine? Nick: Oh my god. I'm slave-driving a pregnant woman. Q: When does it come out? In a bizarre change of pace, direct-to-video action kings Millennium Pictures made this strange little movie. The plot is ripped off from the French movie "The Closet" - in that film, a man pretended he was gay so he wouldn't get fired, and in this film, Lohan pretends she's pregnant so she won't lose her job. It still could have been funny, being able to go off in different directions, but it falls flat. It was obviously shot on a limited budget and hastily filmed. Lohan is badly photographed and seems to have been without makeup. (And her character doesn't come across as a likable person.) You get to see the shadows of camera equipment TWICE. 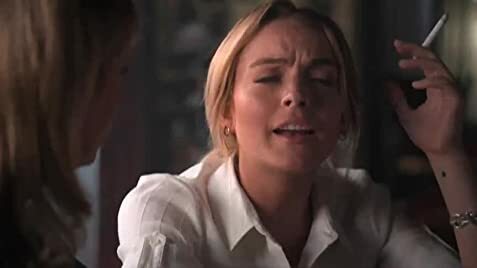 There seems to be footage missing or that was not filmed - Lohan's boyfriend, for example, is introduced in the opening minutes, and is not seen again for a half hour! (And we never see her talking to him about her scheme.) It's also never explained why Lohan for the longest time keeps her sister in the dark about what she's doing. But the worst thing about the movie is that it's not very funny. It's surprisingly low-key, when it should have been zanier. I didn't laugh once, chuckle once, or even smile once at any of the script's situations and dialogue. Maybe I'm not the audience for this movie - it seems aimed at women - but I think its true audience will be as disappointed with this movie as I am.